The mission of The White Roots of Peace Council through Prophecykeepers Foundation is to fulfill the wishes of Hopi, Cherokee and Iroquois "White Roots of Peace" gatherings elders of the 1950s and 1960s in sending their prophetic messages around the world -- to establish peace through the worldwide realization of our ancient common global "relatedness." 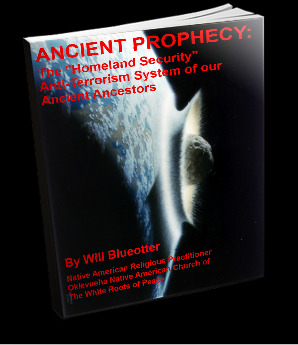 This transmission of prophecies was prophesied--in the Hopi Prophecies--to occur once the "House of Mica" (United Nations) was built, and later visited by the Prophecykeepers... and their further instructions differed depending on whether they were allowed to speak, or not allowed. Since they were barred from speaking at the House of Mica, their "Original Set of Instructions" stated that they were to use any means necessary to get the messages out. The original prophecykeeper elders are mostly all dead now... themselves stating that Purification day would closely follow their deaths... but a few adopted sons and daughters still remain to carry on, themselves up in age. 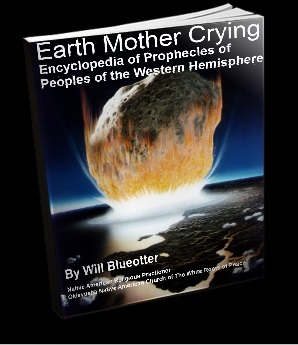 EARTH MOTHER CRYING, book #2 in the trilogy, was prophesied by Tuscarora Wallace Mad Bear Anderson. Wallace "Mad Bear" Anderson Mad Bear, a merchant mariner, was gathering prophecies for a similar book like this when he passed into spirit in 1985, and intended to title it Earth Mother Crying. Originally, these prophecies were all on our website in 1996 at what eventually became www.NativeAmericanProphecy.com, and we named our eBook in Mad Bear's honor once we learned of his prophecy in 1998. We seek assistance of good-hearted persons in publishing soft and/or hard cover versions of these eBooks in all languages. We seek grants to assist in day-to-day operations and in translation of our life-saving publications. Donate to our public foundation! Our FREE Prophecy Encyclopaedia e-books are 1000 8.5 x11" pages BUT are only 50 megabytes of our 1400 megabyte preparedness e-library! We've archived almost 100 Native/Ancient Wisdom interviews... over 150 hours of free listening and growing. We provide free on-demand interviews with traditional teachers to over 50,000 new listeners yearly. We brings untold and underreported native wisdom interviews to listeners worldwide. 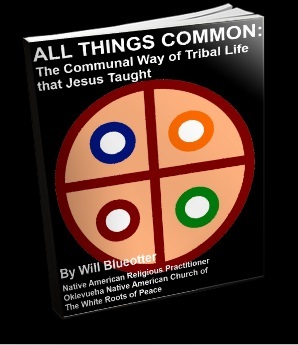 We've prepared reading materials mandated by the Hopi Elders to be distributed worldwide. Listen Free. Our studio is donated. We pay no salaries to anyone. 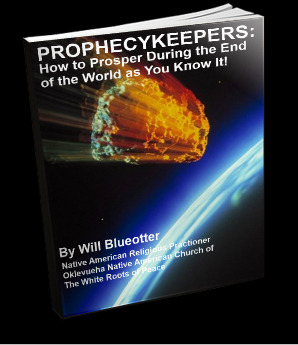 Prophecykeepers won't survive without your help, and you may not find sustainability in the coming USA financial depression without our free teachings. Your host Will Blueotter has had one prophecy given to him in 1998 by Creator concerning bad weather for 2005 which was verified and witnessed to have been fulfilled in great detail by a third party in Jerusalem. Many of our other guests, such as Red Elk, Ghost Wolf, and John Hogue, are also verified prophets in their own right. Preparedness experts and authors speak here about how to anticipate (even learn how to be warned of by Creator) and survive various disasters, both natural and manmade. The next year could give us some real grief in terms of global warming and natural disasters, as the sun is in a period of higher activity. We currently foresees a possible major quakes and bad weather globally. September 2008 is the deadline for fulfillment of Ezekiel's Prophecy! Please click here to utilize our FREE MASSIVE preparedness information e-library product online. You may Join our twice-weekly notification email list and be notified of a new interview free each week. You may also click here and join 500 members of the Native Prophecy Council discussion group.